Summergrove Hall HotelNestled amongst beautiful gardens, Summergrove Halls offer quality, affordable and modern accommodation to long or short-term residents. Our recently refurbished hotel provides a great base for exploring the beautiful West Cumbrian coastline, which is just a short drive away. Close by is the starting point of the coast to coast route in the historic town of Whitehaven with its amazing harbourside marina and the western fells provide a great days walking. Our Grove restaurant serves delicious food every evening, with a warm and friendly atmosphere it’s the ideal place to relax after a long day, or if you’re feeling energetic, why not work out in our fully equipped fitness studio. We also have on site laundry facilities and fully functional kitchens for self-catering and a mini shop for all those essentials. Nestled amongst beautiful gardens, recently refurbished Summergrove Hall offers quality, affordable & modern accommodation for the long or short-term. A great base for exploring the beautiful West Cumbrian coastline only a short drive away. 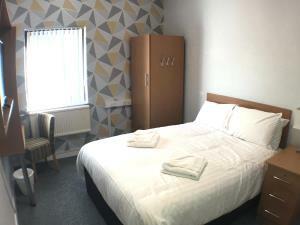 Twin (2 standard singles) or double (standard double) rooms, all with en-suite bathroom (shower cubicle only not over bath) with tea & coffee making facilities, television. Single room with a small double size bed (3/4), space for a Z bed/Cot. Large desk space. All with en-suite bathroom (shower cubicle only not over bath) with tea & coffee making facilities, television. By Road from the South. If you are journeying from the south you should leave the M6 motorway at junction 40 and take the A66 west past Keswick and Cockermouth. Then take the A595 south past the Whitehaven turn off. Continue south and take the B5295 towards Cleator Moor, proceed past Keekle down the hill and take the first right hand turn signposted Moor Row/Summergrove. Proceed along this road for approximately a quarter of a mile and take a right hand turn signposted Summergrove. Proceed along this road where you will find the original arched entrance gate to the Former Summergrove Hall on your left. Take the next turning on the left, this will lead you to the main entrance and parking. By Road from the North. If you are travelling from the north, we suggest that you leave the M6 motorway at junction 43 and journey on the A595 from Carlisle. Progress south, by-pass Cockermouth, Workington and Whitehaven. B5295 Cleator Moor, proceed past Keekle down the hill and take the first right hand turn signposted Summergrove. Proceed along this road for approximately a quarter of a mile and take a right hand turn signposted Summergrove. Proceed along this road where you will find the original arched entrance gate to the former Summergrove Hall on your left. Take the next turning on the left, this will lead you to the main entrance and parking. If you are travelling from Barrow/Seascale. From Barrow take the A595 towards Egremont. By pass Egremont and head for Whitehaven. Turn off the A595 signposted Moor Row. Travel through Moor Row (along Dalzell St) down the hill and take the first left hand turn signposted Summergrove. Follow as above. PLEASE NOTE: We have had reports that SAT NAV devices take you in the wrong direction from the A595 (using a private inaccessible farm lane). Please use the directions as stated above. If you are using SAT NAV please enter this postcode CA25 5QY, this will take you to the residential estate adjacent to us and should take you as above.